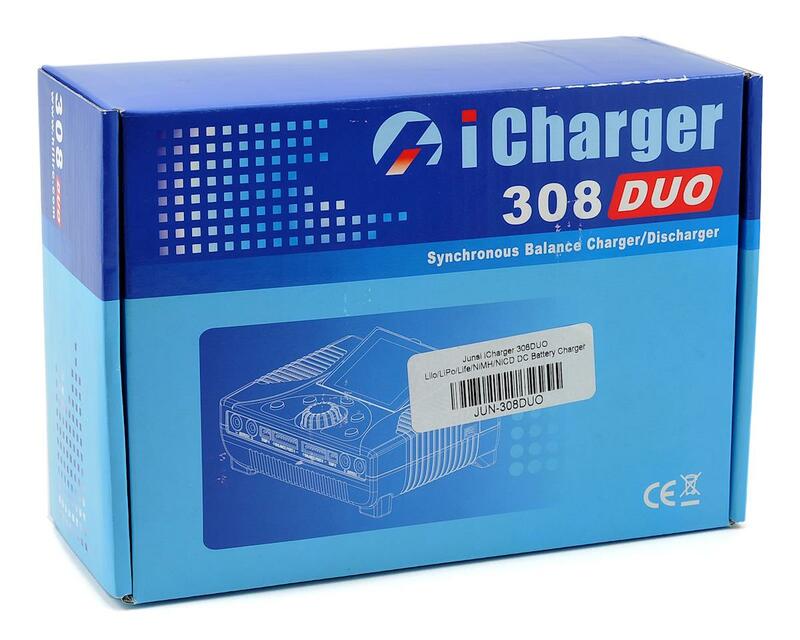 This is the Junsi iCharger 308DUO DC Battery Charger. The 308DUO uses advanced high current and high-performance synchronous buck-boost DC/DC converter technology to deliver 800W per channel and up to 1300W of total charging power in Synchronous Mode, combined with a maximum charge/discharge current of up to 30A per channel and two channels up to 50A in Synchronous Mode! 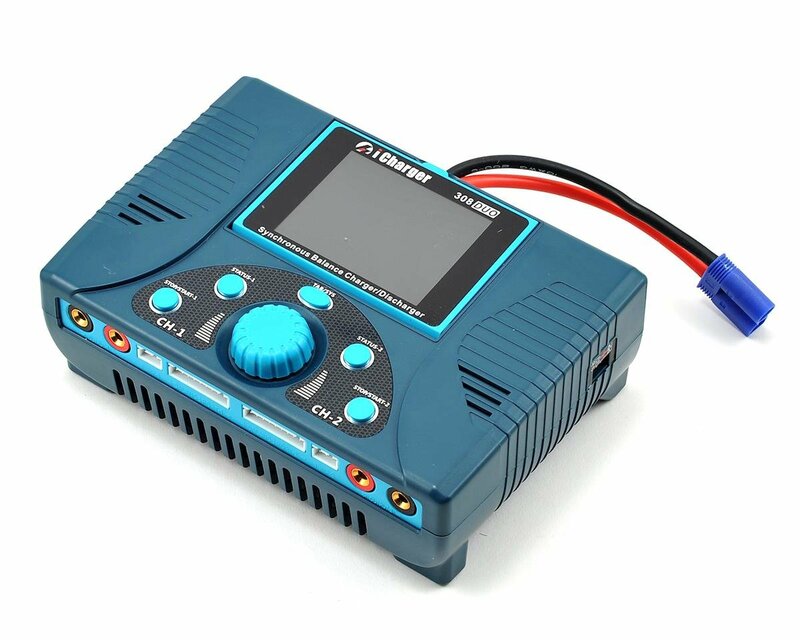 Each channel supports 8s Lithium and NiZn batteries, with maximum 1.2A balance current using a unique "internal resistance correction" balance calculation and can measure not only the internal resistance of the battery pack, but also measure the internal resistance of each cell within the lithium battery. Additionally, the 308DUO also supports 1-20 cell NiMH/NiCd batteries and 1-15 cell Pb batteries. A 2.8-inch LCD screen provides rich information including current, voltage, power, capacity, internal resistance, control status, time-consuming, temperature and more, and a 1A/5V USB charging port makes it convenient for the user to charge mobile phones and other portable USB devices. The 308DUO can save 64 pre-sets with SD Card data support, and also supports upgrading the hardware program through a USB port or SD card. The iCharger also supports “Logview” software and can display, plot and analyze the charge and discharge data of the battery. Other features include anti-sparking protection, intelligent fan control, internal temperature protection, self-discharge, regenerative to input discharge, lithium battery extra expanding discharge, reverse polarity protection (input or output), input voltage/current, battery temperature, charging capacity, overrun time and maximum power protection functions to help keep your equipment safe. 800W of charging power per channel, 1300W when both channels are combined. Maximum charge/discharge current of up to 30A per channel, and two channels in Synchronous Mode up to 50A! Supports upgrading the hardware program by USB port or SD card. Supports “Logview” software and can display, plot and analyze the charge and discharge data. Incredible quality. I was sick of all the 100w x2 chargers out there. it was time for a real charger and this thing is amazing. 30 amps and 800watts per side. Rediculous. 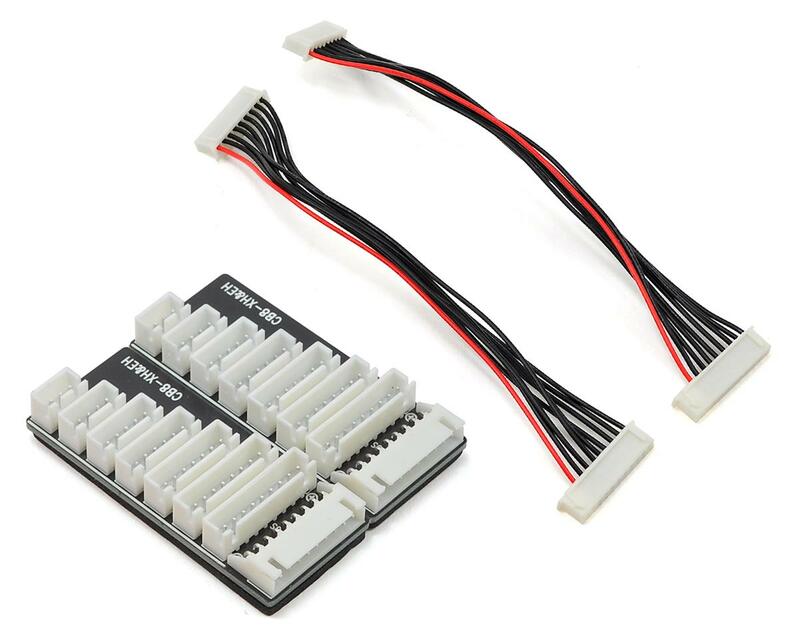 If you're into RC and are an electric hobbiest, this is the right charger for you. I paired mine with a 1800watt custom made HP power supply. Great charger. I am using with a protek 1200watt power supply and it charges and balances very well. The manual is a bit lack luster, but some searches on the popular forums can answer almost any questions you will have. 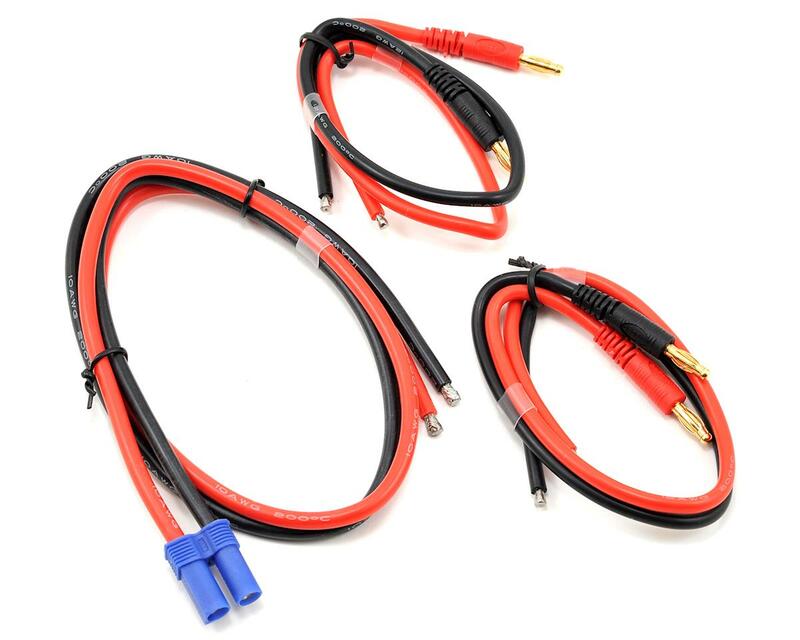 ***Very Important - DO NOT PLUG A BALANCE LEAD INTO THE SMALL PORT ON THE FRONT OF THE CHARGER *** This is a temp sensor port, not a 2s balance port. You will harm the chrger if you plug a balance lead in there. BEST CHARGER ON THE MARKET PERIOD. FAST CHARGE TIMES. PACKS COME OFF FEELING BRAND NEW. BEST INVESTMENT IN THE HOBBY. Fantastic charger for all my 12s packs, does 30amps easily on 24volts and balances my Pulse Ultra 5000 mahs batteries accurately. Easy to learn and use, lots of functionality especially with the IR readings for each cell. Storage charges perfectly to 3.8 volts per cell. Highly recommended and great value compared to the other chargers on the market at this price point. Sweet charger small size! Coming from my trusty Hyperion EOS 0720i Super Duo really nice readout and function. It's a really nice charger and provides any info about your pack you could want. Nice color display and quite compact for a dual channel charger. Shame it didn't even last 2 years. Channel 2 no longer balances. one week old and already showing signs of problems. part of the screen goes dim in the lower left side after it gets warm from use. it looks like it's starting to fail already. it needs some work on the menus. first, I'm not a fan of the scroll wheel now that I have tried it. a touch screen whould be fitting to reflect it's high price tag. even buttons would work better than this scroll wheel idea. some of the menu's are confusing to navigate through as you can't figure out which button to confirm a selection such as naming your own battery into the memory. the instructions are very very vague on this subject. they need to come up with "their own" software for computer analyzing and ditch this logview. It's awful!!! half of it is not translated to english and it crashes all the time. Now I'm starting to hear others online and at the local track say their 4010 duo's 1 of the outputs has failed on them. We'll have to wait and see how it works out in a few months if I'd recommend this thing to friends. right now I'd sell it to anyone that would give me $180 for it. **had to send it to buddy rc for warranty repair. sent me back a different used/repaired charger. not pleased. warranty on a $270 charger should not be here is one with scratches in exchange. buyer beware of buddy rc and junsi warranty. it stinks because I did come to appreciate this charger's power being able to charge my 4s 6000mah batteries in 10 mins. but it seems hit or miss on quality. mine needed a new LCD. but they gave me a dirty pile of crap in return.